It turns out that Fernet has a touchy personality when it comes to proper blending in a cocktail. It is powerful, delicious, even mysterious when served neat, but mix it with other spirits and you walk a fine line between grand flavor and a chaotic mess. Well, I did not enjoy that first Hanky Panky, but I found, to my surprise and delight, that I did enjoy Fernet by itself. I wrote off trying to mix it, and happily accepted Fernet’s traditional rôle as an after-dinner digestif. It nagged at me occasionally that there must be something about its use in cocktails that I just wasn’t getting. Recently I got to thinking about how Carpano Antica’s vermouth improved my opinion of the Saratoga, and wondered what would happen to the Hanky Panky with the Carpano treatment. It blended deliciously. I tried it with Dolin Rouge, and it was another success. So it turns out that the crux of the Hanky Panky is the vermouth. Apparently the way to balance herbs and spices is with more herbs and spices—who knew it was that easy? There’s also what you might call an “environmental” aspect of the Hanky Panky: its flavor is strongly influenced by other things you’re eating and drinking. Fernet has that odd, menthol-laden, dozens-of-herbals flavor that dominates anything it comes near; it is a world unto itself, and external flavors can put its balance completely out of whack. My advice? Let the Hanky Panky stand on its own. Don’t try to eat anything with this drink. 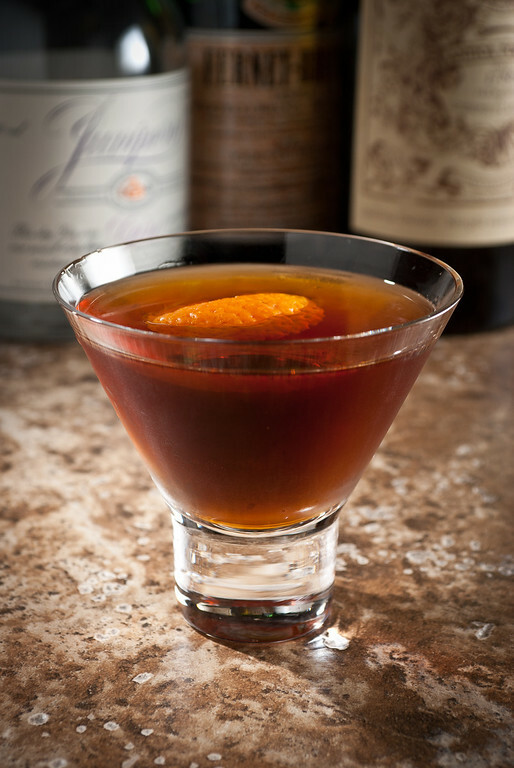 Just as Fernet pairs with nothing, so, too, the Hanky Panky Cocktail—those menthol and eucalyptus notes can put your sense of taste off completely for the rest of the evening. This is a night-ender, strictly an after-dinner, after-theater, after-dessert type of cocktail. Stir over ice until frigid; strain into chilled cocktail glass. Express and garnish with orange. Junipero is a relatively high-proof gin, which works well in this equal-parts blend. (Alas! it isn’t sold in my market, and my imported bottle is getting very shallow. I’ll have to go travelling again to resupply.) A good substitute is the very juniper-forward Tanqueray. The more aromatic vermouths are the ticket with this drink. Carpano and Dolin both work well. The Carpano, with its own vague minty note, seems to tie the gin and Fernet together better; the Dolin adds a cinnamon note that makes a pleasant variation. The orange garnish is a must. Ted Haigh ( Vintage Spirits and Forgotten Cocktails ) says it’s the key to the magic of the drink, and he is right. “Mixing with Fernet Branca—the Hanky Panky Cocktail” at cold-glass.com : All text and photos © 2010 Douglas M. Ford. All rights reserved. Does anybody know the value ?